Let your beauty shine on your special day with a couture bridal gown. At Silk Brides, we work to realise your ultimate vision of the perfect wedding gown. We work with you in close consultation to create a bespoke 'one of a kind' wedding dress that is made for only you. Indulge in the exclusive couture process from the very first designer sketch to the final stitches and perfect final fitting. Prepare to shine on your wedding day with Silk Brides. truly unforgettable wedding gown for your dream wedding. At Silk Brides, we specialise in making wedding dreams come true. Head designer and owner Elena Wille welcomes you to Silk Brides, a boutique bridal wear studio located at Varsity Lakes on the Gold Coast. Your couture wedding dress begins with an informal meeting with Elena Wille at the Silk Brides studio. During this meeting Elena will personally talk with you about your preferred wedding style. You are most welcome to try on wedding dresses from the Silk Brides ready to wear collection to get an idea of styles and design options. Concepts and sketches are then hand drawn. 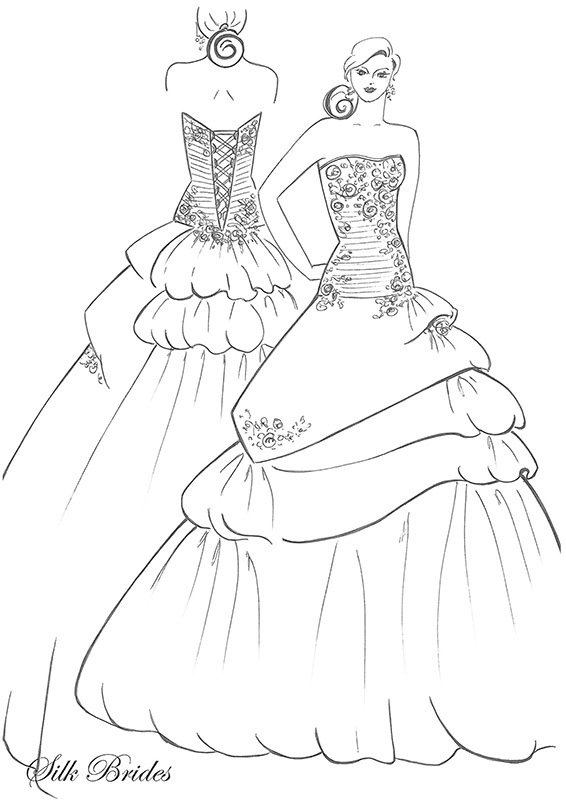 A custom wedding dress is designed to suit your style, personality and figure. Every detail of your dress is discussed fully. You can be involved in every step of the process : choose your fabrics, laces and trim embellishments. Refine your own signature wedding style with Silk Brides. After your wedding dress is designed, it must be constructed. The construction process begins with a 'practice' version of the wedding dress sewn from cotton muslin. This dress is fine tuned to your unique sizing and specifications with personal fittings. At Silk Brides we take the time to ensure a perfect fit that is flattering to every figure. With the 'practice' wedding dress we adjust necklines, fitting and style elements until they are just right for you. The creation of the final custom bridal gown then commences. A happy ending is guaranteed. At the final fitting you may adjust trim elements and finishing touches. Custom bridal accessories can also be created such as bridal veils, fascinators, head pieces and wedding sashes. Silk Brides can provide the finishing touches to your bridal gown ensemble to achieve the complete style. At Silk Brides we offer a couture experience that is highly enjoyable and 100% stress free. Take the hassle out of finding the right wedding dress. At Silk Brides on the Gold Coast, we can create the ultimate dress to truly compliment your once - in - a - lifetime special day. Silk Brides is the Couture Bridal Wear Specialist on the Gold Coast. Make an appointment to visit Silk Brides - where your wedding dreams come true.